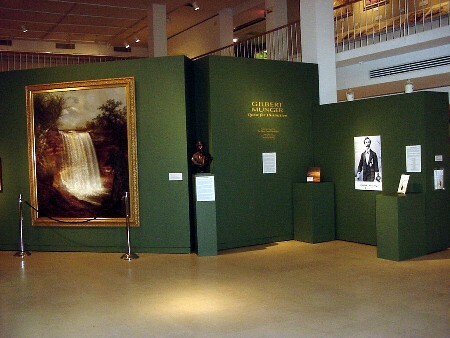 In 2003 and 2004 the Tweed Museum of Art, University of Minnesota Duluth, presented a major traveling exhibition of works by the American landscape painter Gilbert Munger [1837-1903]. This show included many paintings, plus prints and etchings, that were displayed for the first time. The Tweed Museum of Art, Duluth, MN. 26 July through 12 October 2003. Gallery guide. The North Point Gallery, San Francisco, CA. 14 January through 6 March 2004. Check list. The Utah Museum of Fine Arts, Salt Lake City, UT. 1 May through 8 August 2004. The Lyman Allyn Art Museum, New London, CT. 24 September through 5 December 2004. A highlight of the exhibition is Munger's first "great picture," an 84 x 68 inch painting from 1868 that has been hanging on the wall of the original purchaser since 1871. "Minnehaha," depicting the eponymous falls near St. Paul, Minnesota, was taken down from its place in Ralston Hall at Notre Dame de Namur University in Belmont, California, for the first time for the exhibition. 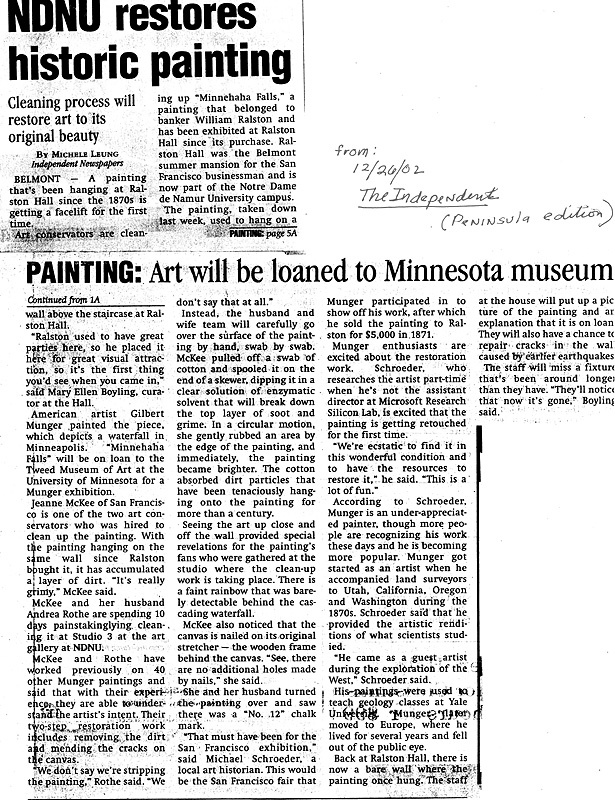 A newspaper article described the removal and cleaning. Resource Library Magazine previews the Tweed exhibition in the April 2003 issue as does the Duluth News Tribune in a July 25 2003, article. Jane Zeta Grover provides a thoughtful review (most of which I don't agree with). 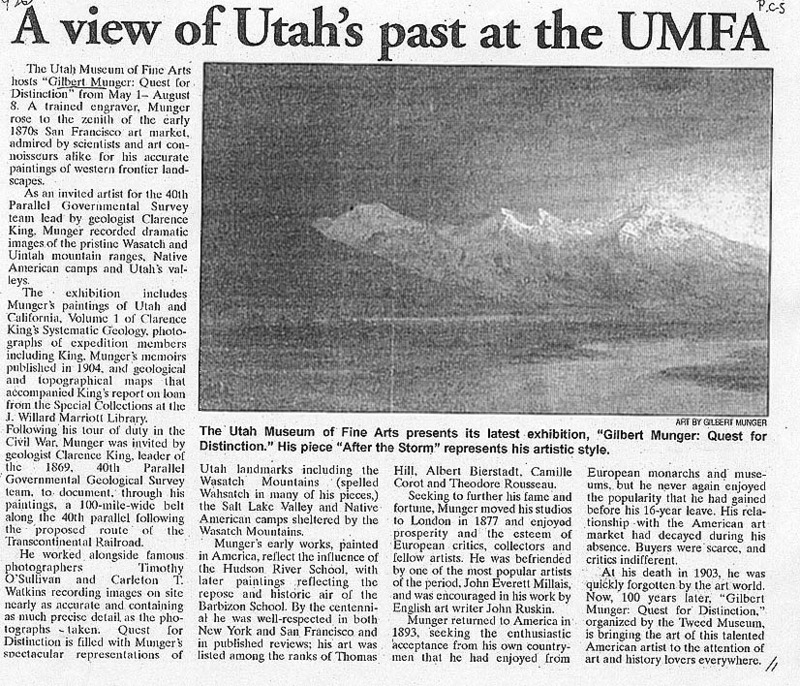 The Park Record of Park City, Utah, also reports on the exhibition at the Utah Museum of Fine Arts.